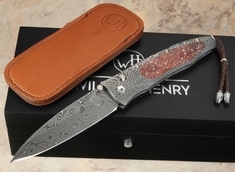 The William Henry B30 Gentac is a beautiful pocket everyday carry knife that comes in many variations, with each type demonstrating William Henry's strength and sense of artistry. 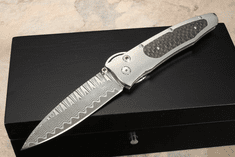 Gentac spear point blades are all 3.25 inches long but are made in a range of designs and blade steel. The B30 series measures at an overall length of 7 inches and a weight of 1.7 ounces, they each have their own designs and characteristics, presenting a very diverse collection. Handle lengths are 3.8 inches long, and all share the slim, ergonomic handle that generally comes with an aerospace grade titanium frame. 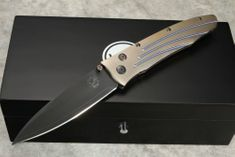 Like the blades, the handles also come in a range of exotic wood inlays, stone accents, and designs. Even the button-lock systems feature distinctive colors and elements, with the thumb stud and one-hand button lock set with white topaz, cintrines, spessartite, and more. Each knife comes with either a titanium pocket clip for carry, or a leather lanyard with a leather slipcase system for carry. And each knife is presented with a wooden presentation box, to keep your pocket knife well-protected when on display. 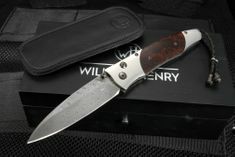 Overall, the William Henry B30 is unlike any other color with its breadth of design considerations, while still maintaining its everyday carry functionality and application.